Angel's Can Fly is a textbook for a fast changing art form, which can now be found in the drama departments of over 200 Australian, New Zealand and American secondary schools and is a prescribed text in some US and UK universities. Buy the paperback from Amazon. 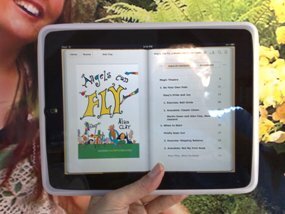 Angel's Can Fly has been released as an eBook for the Kindle Reader, Apple iPad and the Kobo Reader. The Kindle version is available for all mobile devices including the Blackberry, iPhone, iPad and Android phones, as well as for the Mac and PCs. The Kindle edition is US$9.99 from Amazon. The iPad version is US$9.99 and can be purchased through the iBooks app at iTunes. The eBook can also be purchased for the Kobo reader in New Zealand through Whitcoulls (NZ$10.95)or in Australia through Borders (AUS$9.95) or Angus & Robertson. "Angels Can Fly comes with a warning, 'Clown exercises are not for everybody.' Author Alan Clay is quick to explain that in order to engage in the 'experiences' within the text one must be prepared to 'let go of the self'. In truth Angels can fly is not simply a textbook filled with activities from cover to end. As Clay explains, 'You may see it as a novel on the human condition, a clown textbook, a philosophical treatise, or a memoir or oral history.' (p.11). He encourages readers to take from the text what they need and to 'make the text your own'. By the sacrifice of releasing the self, we gain the ability to see the forest rather than the trees, because we get in the way of ourselves. It is the blend of philosophy with instruction that makes this text unique in its approach to the clown art form. Each chapter includes exercises (which increase in complexity as the text progresses) and additional coaching tips which define the activity ad explain the learning process at work. Within each chapter Clay has imbedded an anecdote from notable clown practitioners, including Clay himself. These insights into the clown world are fascinating and if nothing else, reveal how this art form transcends boundaries of class and culture. As Clay highlights his own artistic journey since leaving Clown School in Sweden in 1977, the reader is privileged to be privy to his experiences such as having an audience with the Dalai lama in a Tibetan Children's Village in 1995. Interweaving through the exercises and anecdotes are fictional short stories introducing characters such as Sugar, TC, Madona, Easy and Jasper. Readers can follow the adventures of these clowns and through their antics, can learn about the nature of clowning. Angels Can Fly is Alan Clay's fourth book. A clearly experienced practitioner, Clay offers a through exploration of the clown art form for those who are willing to 'surrender' themselves to all it has to offer." The book is now available through bookshops in New Zealand, Australia, America, Canada and England, and also through online stores like Amazon. Also check out Alan Clay's short clown film, , staring Annette Devick from Canada and Mark Hudson from Australia which was shot in New Zealand in October 2006. And also the new comming of age romantic comedy, Courting Chaos, shot in Los Angeles in 2013, in which a Beverly Hills girl falls for a Venice Beach street clown named Chaos and she must overcome her inhibitions and become a clown herself for the relationship to survive. "Clown is a fascinating, diverse, complex and exciting art form, which has existed around the planet for thousands of years. "Like any art form it has to evolve to stay relevant to the culture nurturing it, and at the same time, and by its very nature, clown teases and turns upside down the cultural patterns and boundaries around us. "Angels Can Fly is an attempt to chart the growth of modern clown, and to promote that process by providing, not only practical exercises for individuals and groups, but also reference points for thinking. "The book includes a mix of fiction which follows the adventures of ten clown characters, some personal clown anecdotes from clowns from around the world, a total of 50 practical clown exercises, and some theory on the nature of modern clown." This site published by Artmedia Publishing. The content of this site is copyright, and no part may be reproduced or transmitted for commercial purposes, without the prior permission in writing from the publishers. Click on this link to find similar sites, or to subscribe to the Artmedia e-publishing newsletter.